Congratulations to the winners of the autographed mysteries contest. Betty Webb's The Anteater of Death will go to Pauline M. from Midvale, UT, and Death Books a Return by Marion Moore Hill will go to Lillian B. of Cape Elizabeth, ME. The books will go out in the mail tomorrow. This week, I'm going away the debut mysteries by two authors. 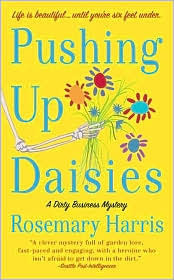 When Rosemary Harris was in Glendale a week ago, I had her autograph two copies of her first mystery, Pushing Up Daisies. If you read Wednesday's blog, you'll see that this book was just nominated for an Agatha award for Best First Mystery Novel. So, here's your chance to discover the first story about Paula Holliday, the gardener who expects to dig up dirt, but not mummified bodies. 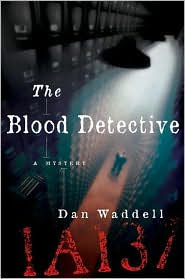 Or you could win an ARC of Dan Waddell's fascinating mystery, The Blood Detective. Genealogist Nigel Barnes is the London Police Department's only hope in solving a string of murders when the clues on the bodies lead to the city archives, connecting to a string of murders that are 100 years old. It's a complicated, satisfying book. There will be three lucky winners! Which book would you like to win? If you'd like to win one, email me at Email me!. If that link doesn't work for you, the email address is: lholstine@yahoo.com. Your subject line should read either Win "Pushing Up Daisies" or Win "The Blood Detective". Your message should include your mailing address. Entrants only in the U.S., please. The contest will end Thursday, March 5 at 6 p.m. MT. Jim will draw the winners at that time. The winners will be notified, and the books will go out in the mail on Friday. Good luck! I am always looking for a good mystery. Please pick me. Good luck! I hope you sent your name and mailing address to me at lholstine@yahoo.com. Thanks! I snagged a copy of DAISIES as soon as it came out. I'm sending e-mail for BLOOD DETECTIVE. You're welcome, Caite. Good luck! Thanks!! I'd love pushing up daisies. Good luck, Pam! Make sure you send me your name & mailing address at lholstine@yahoo.com. still trying to win books to feed my bookworm addiction.